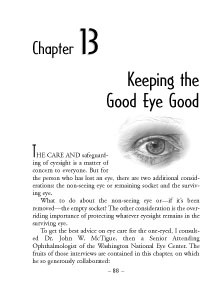 In this chapter, Mr. Brady deals with care of both the unseeing eye (or socket) and the remaining eye. "If your damaged eye has been removed by surgery (enucleated), care of the remaining socket is usually very simple. Should you decide on a "glass eye" for cosmetic reasons, make sure it's well fitted by an expert; a poorly fitted shell can irritate the conjunctiva, the mucous membrane that lines the eye lid. This or any other irritation of the socket--from infections, foreign bodies, etc.--is usually not serious, provided you have it treated promptly by an ophthalmologist.